The majority of workloads will be processed in public and private clouds by 2020. Companies must identify and extract only the most relevant monitoring data. You can’t monitor what you can’t see. That seems overly simplistic, but it is the heart of the problem facing IT departments as their apps and other data resources are more widely dispersed among on-premises systems and across public and hybrid clouds. Universal visibility will become more important in the future: according to the Cisco Global Cloud Index, 92% of all workloads will be processed in public and private clouds by 2020. To address this “visibility gap,” companies have to find a way to identify and extract only the most relevant monitoring data to avoid swamping your monitoring, analytics, and security tools. 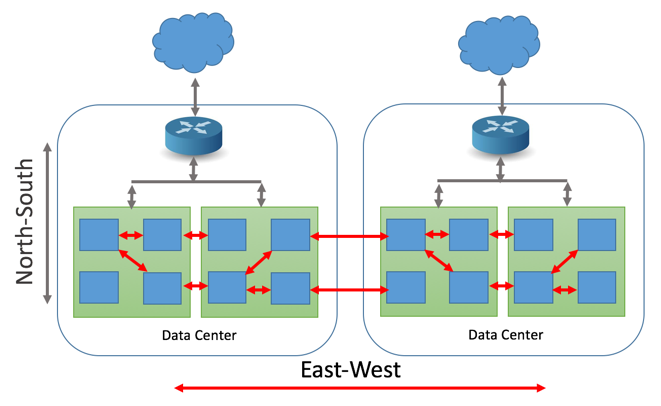 One problem is that in virtual data centers, 80% of all traffic is internal and horizontal, or “east-west,” according to Cisco. By contrast, most cloud traffic travels vertically, or “north-south.” They’re not designed to scale up and down fluidly as virtual machines are created, run their course, and disappear. Adopting a virtualized infrastructure flips network traffic monitoring from predominantly east-west to predominantly north-south (Source: NeuVector). Realizing all the efficiency, scalability, and agility benefits of today’s virtualized infrastructures requires monitoring four distinct aspects of application traffic. As an app scales up to accommodate exponentially more users, the tool you use to monitor the app has to be capable of scaling right along with it. What may appear as a single virtualized environment is in fact partitioned to secure sensitive applications and data. Monitoring traffic between the virtual segments requires peering through the virtual firewalls without compromising the security of the protected assets. Analysts anticipate a ten-fold increase in the use of containers as more companies convert their apps into multiple virtualized containers to improve app performance. Your monitoring system has to access these containers as quickly as they are generated and redeployed. The lifespans of virtual machines, containers, and the apps they comprise are shorter than ever, which means the DevOps team has to keep pace as it deploys new builds and updates existing ones. This includes the ability to archive and retrieve monitored data from a container that no longer exists. It’s not just the people charged with app performance monitoring who are racing to keep pace with the speed of virtualization. Security pros are struggling to find tools capable of identifying and reporting potential breaches of widely dispersed virtual networks. Network security managers often don’t have access to monitoring dashboards and are unaware of on-the-fly network reconfigurations. This has led to a new approach to network modeling that extends virtual networks into the realms of security and compliance in addition to performance monitoring. The key is to normalize data from diverse sources – whether physical, virtual or purely cloud-based – and then apply a single set of network policies that encompasses security and performance monitoring. Perhaps the biggest change in mindset is that all data traffic has to be treated the same. The traditional north-south pathway into and out of the network that's always posed security and monitoring challenges, as well as the east-west transmissions inside the network that in the past were considered trusted and 100% contained. There is no longer a “trusted zone” within the organization’s secured perimeter. More software being deployed and updated more frequently. A more diverse software stack comprised of new languages such as NodeJS and new runtime environments such as Pivotal Cloud Foundry. 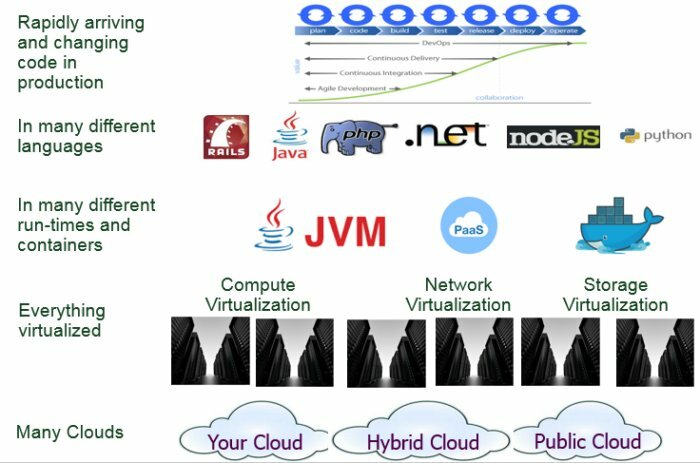 Applications are increasingly abstracted from hardware with the rise of network, compute, and storage virtualization, as well as JVM and Docker. The rise of the virtualized, dynamic, and automated infrastructure. The monitoring challenge: faster, more frequent app deployments on increasingly abstracted, dynamic, and automated virtual infrastructures (Source: Network World). If you’re relying on a single vendor for your network monitoring operations, you’re missing out. The new reality is multiple tools from multiple vendors, which makes it critical to select the optimum set of tools for your environment. The pit many companies fall into is what Harzog calls the “Franken-Monitor.” Each team relies on its own favorite tool at the exclusion of all others, so you spend all your time trying to move performance data between these virtual silos. To avoid creating a monitoring monster, place the metric streams from all the tools in a common, low-latency, high-performance back-end that lets the performance data drive IT the same way business data drives business decision making.